Projects Abroad is starting a new ?Marine Mammal Conservation volunteer project in Mozambique. 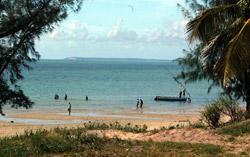 Projects Abroad's new project is based in the town of Vilanculos on the south-eastern coast of Mozambique. This coastline is one of the last remaining breeding grounds of the dugong. Volunteers work with the community to address problems of over-fishing and prevent dredging of the sea bed which destroys the sea grasses in shallow water which the dugongs feed on.